Coca-Cola North America does more marketing in a day than most of us do in years. And judging by the record, they do it extremely well. At the risk of seeming picayune, here’s some constructive criticism. Remember Coke’s Great Christmas Can Controversy last year? The hubbub caught Coke off guard. So in reaction mode, Coke looked online for supporters. There, the Coke marketing team ran across the very blog you’re reading now, and this particular post: Three Lessons From A Coke Napkin – which had been posted in May 2011. On November 29, 2011, at about the height of the “controversy,” I received an email via my blog’s contact page from Traci McDougle, an assistant at the Coca-Cola Company to Katie Bayne, President & GM of Sparkling Beverages at Coca-Cola North America. Traci asked for my mailing address and contact info, for Ms. Bayne. Coke swag. From Coke HQ in Atlanta. My blog has never been a huge comment magnet (in spite of help from Bill Dorman, Gini Dietrich and Arthur Germain) so it was quite nice to get an email via my blog from high management at Coca-Cola. Of course, my imagination got the best of me: Maybe she likes the way I think. Maybe she wants to talk. Maybe she has an assignment. Visions of marketing sugar plums ensued. What did she want? My answer came a few days later via UPS, in a box almost too big to get through the front door. It was a rather large Christmas-themed gift, with a kind note from Ms. Bayne, thanking me for being a fan of Coke’s marketing. 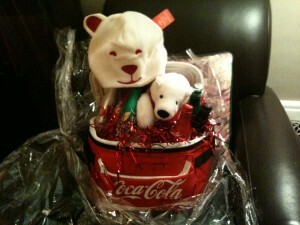 Now, I loved the Coca-Cola swag. And I truly appreciated the gift. But I have to admit, I felt a bit let down. What does every blogger want? Coke could have taken a different approach, and with a lot less effort, given me a much bigger thank you. For a truly social-media savvy response, Ms. Bayne would have simply written her thank-you note as a comment response to my blog post. For a bigger splash, she could have offered some insider insights or commentary. To go completely over the top, she could have tweeted it, posted it to Facebook or featured it on a Coke blog. A comment from the president of sparkling beverages of Coca-Cola North America – helping me get some traction for my blog and maybe a stream of new comments and followers – now that would have been some kind of thank-you. And I would have been forever indebted. Bruce Cleveland, partner at InterWest Partners, says: Social media strategy needs to include authentic customer engagement and not be viewed and used as yet another one-way digital advertising channel. Later this week, his team will present data to back up his assertion. Don’t just monitor social media when there’s trouble. Monitor it for opportunity. A blog comment, a retweet or “reply to” on Twitter, or a Facebook comment can go a long way – even if you’re not President of a Major Business Unit representing one the World’s Most Iconic Brands. It’s more than a chance to address issues. It’s a chance to make friends and fans. A chance to grow your own community by participating in other communities. Of course if they had sent a Coke-red Christmas Ferrari, I might feel different. Most large brands are struggling to find their voice in social media. You don’t have to struggle. You can participate. Do you agree? This entry was posted in Communication strategy, Inbound marketing, Social media for business and tagged Arthur Germain, Bill Dorman, Bruce Cleveland InterWest, Coca-Cola marketing, Coke marketing, Gini Dietrich, Katie Bayne Coke, social media engagement, social media marketing, Traci McDougle Coke by barrett. Bookmark the permalink. I concur; send me your gift, I will take it. Of course in the south, any soft drink is a coke btw. My dad was a life long employee of Minute Maid which was bought by Coke. Because of this, he had Coke stock and it got me interested in the financial pages of the paper at a very young age. Thanks for the mention. It was interesting to go back to the post you commented on to alert me of this. Most of those ‘names’ that had commented last May are gone or at least not at my place……interesting indeed…. Any soft drink is coke, btw — except RC Cola! I go back and forth between thinking that Coke should do better at social media, and thinking maybe they don’t need to. They do so much great work that I respect tremendously. They also have one of the world’s top ad agencies hitting on all cylinders. So why do they need to comment on my silly little blog. Then I think that for the time and effort they expended sending me a huge box with filled of Coke could have been far more effectively spent on meaning engagement on social media. Who knows how much goodwill that would have bought them. I’m just so hesitant to criticize folks who are so good at what they do. Great to hear from you Bill. Your blog looks fantastic and I don’t visit enough. RC Cola and a moonpie, right? Ah, the classic Southern breakfast! I agree — she was playing by old rules, send a nice gift to someone as a thank you. I’ll bet her social media marketing team could have used your support in its efforts, though! I think Coke may be slow adapters to social media, which doesn’t bother me. Sometimes slow adapters are just waiting for the rules to formulate themselves. Then they jump in with a vengence. Remember the old PR adage “Any ink is good ink?” My belief is that pretty much holds true with social media today. One of the most important lessons marketers (especially big marketers) can learn about social media participation is to avoid the inclination to be “perfect” and just “do something.” If it’s right, it’s a home run. If not, people will forget about it in fifteen minutes. As long as what they do is transparent, and doesn’t include a hidden agenda, all will be forgiven. Your point is a good one though: what do bloggers want? (Well, duh, an AUDIENCE.) Who knows, another box o’ swag may be on its way. Mickey Lonchar recently posted..Camouflage advertising. Mickey, I find that sometimes I get paralyzed by the effort to be perfect (not that you could tell from my blog posts). Imagine what it would be like working for Coke, or Nike, or some of the other huge brands. But you’re right, social media is not the place for perfection. It’s the place for transparency and, I believe, a spirit of generosity. At least on the part of the brand. I sure would love to have Dan Wieden, Mike Hughes, Katie Bayne, Tony Hsieh, Tim Cook or Mark Zuckerberg leave a big fat comment. But I’ve got you here, and that’s pretty sweet! It’s not so much that they did SM wrong.. they just responded to a social action in a traditional way. It’s the social currency that they missed, that swag was nice but for you a RT and blog comment is better swag. I wonder if they have a policies about responding or commenting on SM? I mean, any RT or Like from an official Coke rep is an endorsement, right? What if you’re like me and get a little offensive? Also have to think – they get blogged – A LOT. I mean, I’ve mentioned the brand. It’s encouraging that they are monitoring and listening but practically, I cannot imagine they have time (and there is ROI) on replying to every mention. IDK I think the lesson other businesses can learn is to pay attention to those social mentions, part of participating means learning about your fans. And yes that means engaging them in kind. FWIW. Not only would that have been a really nice gesture, it would have been a lot more cost-effective. But, I’m curious. What did you do with the gift? Davina, thanks so much. I’m glad you mentioned ROI — it’s been on my mind since I wrote the post. I’m unsure about it. But obviously, they thought there was value in sending me a gift. Who knows how much involvement the president of the entire business unit actually had. Is it worth it for her to spend time replying to blog posts — when she could be huddled up with Dan Wieden planning the next legendary Christmas or Super Bowl commercial? I do think that, compared to sending a traditional gift, there’s more value in responding to the blog post, using the opportunity to expand the Coca-Cola brand story. I’m no expert in mega-brands in social media. It would seem, though, that these brands should have a social media team that lives the Coke brand, communicates in a personable and generous way, and is out there building a new dimension of brand value. I’d love to get an inside look at their organization. And I do think they can retweet or Like judiciously. Gini, look — here it is just an hour later — not a year and a half — and I’m responding!! I can tell you that we drank about a third of the gift, but not right away — there were about a dozen of those beautiful all-aluminum bottles of various Coke brands. About a third has become part of my wife’s wardrobe and collection of plush toys. And final third, the soft-edged Coke cooler, has been with us on numerous weekend trips. None of it, to my knowledge, has ended up at Goodwill. Yet. Congrats, Barrett, on writing a blog post that caught the attention and personal response of a very high-level North American Coca-Cola executive. She obviously appreciated your strategic insights into Coke’s branding captured on the napkin. You are in an elite class of writers/bloggers who have ever received such a special response, I’m sure, and it was certainly an opportunity to continue a personal conversation with Coke and Ms. Bayne. A conversation, off the grid, that might have developed into an opportunity for a meeting and introduction for you, which would have probably had far more business impact than a blog comment or RT. I don’t think her gesture had anything to do with social media savviness, but everything to do with private gratitude for your blog observations. I think it’s refreshing that such a global giant can be so personal with a thank you. I imagine, however, that she’s surprised by your blog title and response to her gift. I’ll be interested to know if she reaches out in response. Maybe she will be surprised, if she ever sees it. Believe me, she’s most welcome to visit and comment on this modest little blog. As I’ve said elsewhere, I’m hesitant to criticize people who are the top of their profession, doing quality work that’s plain to see every single day of the year. The Coke team must certainly be one of the very best there is. But the whole thing just naturally raised questions in my mind: Do they monitor the web? They must, right? Did they not see my post when I originally posted it in May? If they didn’t see, should I have done something to make the post more visible? Did they see it in May and decide not to respond until there was a PR situation? Again, why? Or was the whole thing unrelated to their situation? Perhaps. The gift and the gesture were wonderful, and appreciated. Maybe I should have entitle the post: “A Missed Opportunity”? First, a disclosure. For some reason, Don followed me on Twitter. It gave me the same kind of feeling that my best friend got when Darius Rucker friended him on Facebook. So when I invited Don by DM to stop by the blog for a visit, I didn’t think he’d really… Don, what a pleasure it is to have you visit and comment. OK, enough of this pathetic hero worship. Don, in the post that you link to, you talk about ARIA Ã¢â‚¬â€œ what people in the social media space want: Acknowledgement, Recognition, Information and Access. Anyone who has read this far really ought to read your post, “How NOT To Do Social Media Marketing,” http://ow.ly/cyMJU — in addition to the link in your comment. When it comes to my mixed emotions about my gift from Coke, you’ve absolutely nailed it. (Not that I think Coke was buying my friendship. It’s just that feeling…) I wish I had read those two posts when you wrote them! Your blog is a great resource. Thanks so much for sharing, and please stop by again. Dr. B, a belated thanks for stopping by and leaving such a kind comment. Cheers!